Filmmaker Gloria Rolando is currently on a US visit, her remaining states as of 10/22 include North Carolina, Maryland/DC, Pennsylvania, California, Georgia, Wisconsin, Massachusetts, and New York. The visit is based on an invitation to give the US premier of her film "Reembarque" / "Reshipment" at the "WITH/OUT - ¿BORDERS?" Conference at Kalamazoo College, Sep 25 to 28th, organized by Lisa Brock. She will be showing her latest films, 1912, Breaking the Silence, Chapter 3, on the Massacre of 1912, and "Reembarque" / "Reshipment" on Haitians immigrants in Cuba who were sent back in the beginning of the last century when the sugar market crashed and they were unwanted. The 3rd chapter of 1912, Breaking the Silence premiered in Havana in May of 2013 and received much critical aclaim. Reshipment premiered in Havana September 10, 2014 and in the US on September 28, 2014. The three chapters of 1912 caused her to receive the Caracol Prize for directorship from UNEAC in October of 2013. Gloria sends out an appeal to help defray the costs of repairing the house of Pedro Ivonnet's granddaughter, Ivanoa Ivonnet, which was damaged by Hurricane Sandy. Pedro Ivonnet was a founder of the Independent Party of Color, which was destroyed in the 1912 Massacre. Gloria is on the menu, she has a wrap named after her! •Thursday, Oct. 30th, 12:30 PM, ATS 142: Breaking the Silence. •Thursday, Oct. 30th, 7:00 PM, Robert Smith Center Theater: Reembarque/Re-embark. •Friday, Oct. 31st, 3:00 PM, Spotts 111, Auditorium: Raices de Mi Corazon/Roots of My Heart. Havana-based Afro-Cuban filmmaker Gloria Rolando will present her newest documentary REEMBARQUE (59 minutes, in Spanish, Haitian Creole and French with English subtitles) during her November Bay Area visit The peoples of African ancestry in Cuba have a complex history. During the early part of the 20th century and before the Cuban Revolution, Haitian migrant agricultural workers faced hardships and discrimination while toiling in Cuba. Many were forcibly deported when they were no longer needed. However they left behind their rich spiritual practices, dynamic music and dance, as well as their history of resistance. The voices of prominent historians join the memories of Haitians and their descendants in Cuba to understand a forgotten chapter in Caribbean history. Friday, November 7, 6:30 PM Eastside Arts Alliance, 2277 International Blvd. Oakland. Thursday, November 6, 9:30 AM City College of San Francisco-Ocean Campus, 50 Phelan Avenue, San Francisco, Multiuse Building, Room 140. Co-sponsors: Library, Diversity Coalition, Concert and Lecture Committee. Thursday, November 6, 2:30 San Francisco State University, 1600 Holloway, Cesar Chavez Student Center, Richard Oakes Multicultural Center. Cinnamon Traveler Heritage Trust is pleased to announce the return of award winning AfroCuban filmmaker Gloria Rolando to Atlanta Georgia. Gloria is in attendance on the 16th and 18th, films from 15th to 19th. Afro-Cuban filmmaker Gloria Rolando to visit Milwaukee 11/11/2014 Milwaukee Journal Sentinel: "Her works include "1912, Breaking the Silence Chapters 3", an account of the massacre of thousands of members of a black political party in Cuba, and "Reshipment" on Haitian immigrants in Cuba who were sent back to Haiti in the beginning of the last century when the sugar market crashed. Her visit here is sponsored by The Community Media Projects and the department of film, video, animation and new genres, with support from the department of Africology, cultures and Communities, CLACS and Global Inclusion and Engagement." 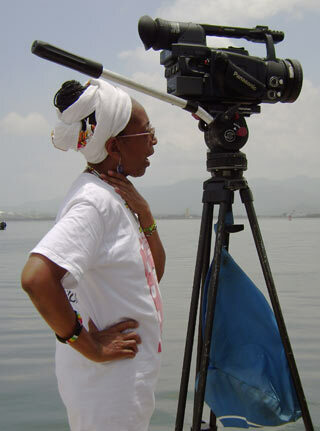 Acclaimed Afro-Cuban filmmaker Gloria Rolando will present the final screening of her 2014 U.S. Tour highlighting her latest documentary, Reembarque on Tuesday, December 2, 2014. Reembarque is a poignant look at the stories and legacy of the hundreds of thousands of Haitians that fled the U.S. occupation of their country in 1920s and 1930s to find work in Cuba. This film has received very powerful reviews and has played to enthralled audiences at Spelman College in Atlanta, Indiana University, San Francisco, Oakland, Philadelphia, Baltimore, and more. This will be the only screening of Reembarque in Miami. The event is free but it is urged that attendees RSVP by November 25 to José E. Pérez at jose3perez_AT_outlook.com (change _AT_ to @) and (305) 791-3182. *Respondees should include " #Reembarque " in the subject line or body of text. Celebrating Hispanic Heritage Month, Taller's Meet the Author Series presents Cuban filmmaker Gloria Rolando. Saturday, October 18th, 2014 @ 3 p.m.-5 p.m. Breaking the Silence (Part I of III) reveals the hidden story of black soldiers after the Cuban revolution of 1912, giving voice to those who gave up their lives for an ideal, in the midst of injustice, discrimination, and abuse. The second work shown will be Jazz and Us. Both documentaries are in Spanish with English subtitles. The presentation will be in Spanish with English translation. Thanks, and we'll see you at the event!